Spam is my regular store cupboard ingredient. A slice or two fried till golden on a bowl of instant noodles with a fried egg will always satisfy the junk food mood I am in sometime. To show my continuous support for all things spamalicious, spam fried rice does occur on my dining table every now and again, another fast food fix. Today's spam fried rice is slightly different. I have a jar of XO sauce hiding at the back of my cupboard that needs using. 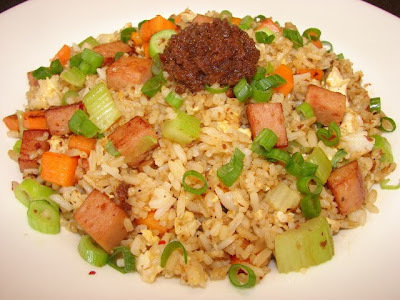 So I thought why not XO sauce fried rice with spam. Great idea! Before I continue, you may ask what is XO sauce? XO sauce is a spicy seafood sauce (more like a paste than sauce) created in Hong Kong by some Cantonese restaurant first then mass produced by big sauce producer like Lee Kum Kee. Why is it called XO? The word XO derived from the expensive connoisseur XO cognac, to make this sauce sounds very posh. XO sauce is considered the connoisseur class sauce because it has expensive ingredients like dried scallops, dried shrimps, some Chinese dried fish, and not forgetting the expensive Chinese dried cured ham, all ground up. It is spicy with dried and/or fresh chillies, garlic and shallots as a base. The mixture is fried with plenty of oil till very fragrant till most moisture has evaporated leaving a concentrated spicy paste sauce full of umami. The sauce texture is similar to Thai chilli paste (nam prik pao). 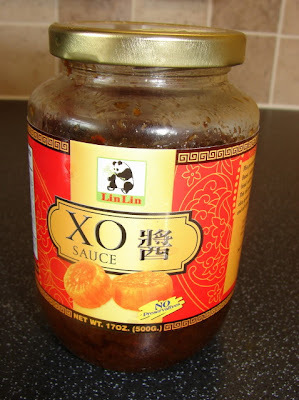 Most brands of XO sauce are very expensive, one small jar can be around £8 -10. I won't pay for this much for a sauce. The one I bought is at bargain basement price of £2.99 and big jar too. Doubt there is much dried scallops. The taste is not bad, not as tasty as the expensive ones, but still good value for money. Here is a picture of this cheap XO sauce. Once opened keep in the fridge. *If you have problem with fried rice sticking to the wok, this tip may help you. Make sure you use a clean work. Heat the wok without any oil till very very hot. Add a touch of oil and spread it all over the wok. Heat till smoking hot. If there is any excess oil in the wok pour it away or wipe with paper towel, this oil may taste burnt. I have used this method never have rice sticking. Next thing I always do is stir fry rice with egg first till fragrant and hot. Then stir fry the vegetables and meat separately. Never add wet ingredients (like meat and vegetables) to stir fry together with the rice. This is likely to make the rice turning soggy and sticks to the wok. 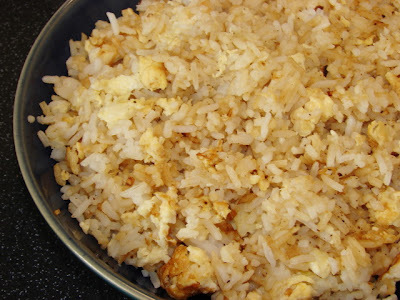 When the vegetables and meat are done, add in the hot egg fried rice last, stir and ready to serve. Another point to remember is the rice should feel quite dry and easily separated into individual grains. If the rice is soggy, it is no good for any fried rice. To make the egg fried rice. Good to eat on its own or add vegetable and meat later. Continue from when you have heated the wok and lightly greased it with oil and heated till smoking hot. Keep the heat at maximum. Now add some fresh oil about 1 tbsp and immediately add in chopped garlic. Before garlic getting too brown add rice, stir and stir and break up any large lumps of rice by pressing with a cooking spatula, heat the rice till hot. Then push the rice to one side, tilt the wok if you can. Add a few drops of oil to the empty side of the wok, pour in the beaten egg. Scramble the egg till lumpy then fold in the rice. Stir and break up any large lumps of egg. Season with some light soy and ground pepper. Remove. Ready to eat as plain egg fried rice or leave aside to add in some vegetables or meat later. The wok after frying the rice should be very clean. Now add few drops of oil to the wok. Stir fry the spam pieces for about a minute. Then add in the carrot and celery. Continue stir frying till spam is lightly brown on the outside and vegetables are soften. Now add in the egg fried rice. Stir and add 2 heap tbsp of XO sauce. Stir and add chopped spring onion. Ready to serve. Put rice on serving plate or bowl. To accentuate there is XO sauce in the rice put a small dollop of XO sauce on top of the rice. I think we grew up on Spam in my household! At school they'd occasionally serve spam fritters for lunch - which were nice at first but disgustingly greasy halfway through! My mum would make a very tasty alternative. Slice the spam in half from top to bottom, then slice into square shaped slices. Dip in beaten agg and fry gently in a pan adding any left over egg in the pan - it's a bit like spam omelette in a way. Another quick and easy lunchtime dish she'd do (we gave up on school dinners and came home for lunch when we were in primary school) was to place the opened block of spam onto a small dish/saucer with high sides and put the dish in the rice cooker when the water has evaporated. taht way it stemas in the residual water/heat. She'd then cook another dish and probably add a dish of blanched iceberg lettuce. Simple and quick lunchtime childhood meals. Spam is often one of mum's cupboard staples to this day! I'm loving your work here you are really giving great advice.